Most of us love our dream cars. Wash them tenderly and polish out their imperfections. Not smash them to bits with sledgehammers. Most of us love our dream cars. Wash them tenderly and polish out their imperfections. Not smash them to bits with sledgehammers. But that’s exactly what a Chinese Maserati owner has done to his own $428,000 Quattroporte. 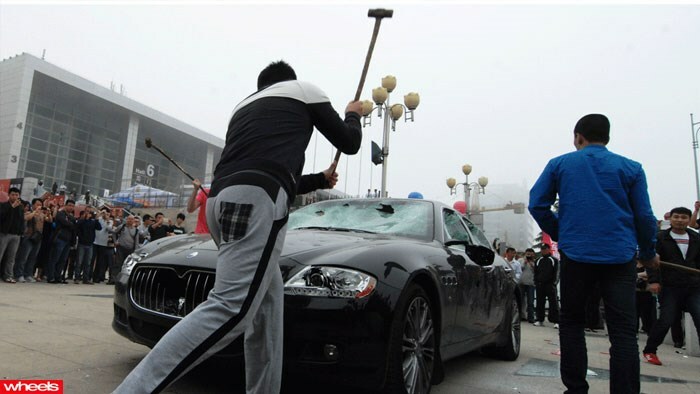 The act was a dramatic stand against bad customer service, with the Chinese man – who is only known by his surname Wang – hiring two other men to attack his car in front of a crowded motor show yesterday. Wang reportedly took his Maserati, which he purchased in 2011, to a dealership in Qingdao, but became incensed when he discovered second-hand parts had been fitted to his car. A long and bitter legal dispute with the dealership is said to have proceeded the protest, which Wang organised by contacting Chinese media and spreading the word through social media.